Dalmatian Italians are a historical national minority in the region of Dalmatia which is now predominately part of Croatia. When Austrian Empire occupied Republic of Venice's region of Dalmatia in 1815 the Venetian (Italian) population made up, (according to the Italian linguist Bartoli) nearly one third of Dalmatia in the first half of the 19th century. The 1816 Austrian census registered 66 000 Italian speaking people among the 301 000 inhabitants of the Kingdom of Dalmatia, or 22% of the total Dalmatian population. After World War II, the Dalmatian Italian population was reduced  to 1,000–4,000 people in todays Croatia Dalmatia and Montenegro. Today they reside mostly in the city areas of Zadar, Split, Trogir, and Sibenik in Croatia, and Kotor, Perast, and Budva in Montenegro. 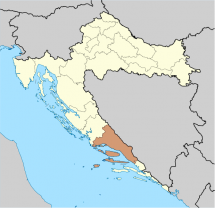 In other parts of Croatia, there are Italian communities located in the Istrian peninsula and the city of Rijeka. Note: During the Austro-Hungarian census of 1910, 2.8% Italians were registered in the Kingdom of Dalmatia. This high drop can be explained by immigration as well as families who where of dual culture (Italian-Croatian), who decided to register themselves as Croatian (Hrvati). According to scholar Theodor Mommsen, Roman Dalmatia was fully Latinized by 476 AD when the Roman Empire collapsed. More recent theories have suggested that this would only apply to cities and towns, whilst in the country side, this would not have been the case. The Ostrogoths (a Germanic tribe related to the Goths) ruled Roman Dalmatia from 480 to 535 AD. Barbarian invasions from the 6th century on-wards,  brought certain Slavic tribes allied with Eurasian Avars  which invaded and plundered Byzantine's - Roman Dalmatia (aka Eastern Roman Empire, they referred to themselves as 'Empire of the Romans' Latin: Imperium Romanum. please note the Eastern Roman Empire survied after the fall of Rome). This eventually led to the settlement of different Slavic tribes in the Balkans. Modern scholarly research now puts the time of the settlement of the Slavic tribes in the old Roman Dalmatia region to be much later and smaller in numbers. Archaeological evidence found in the old Roman city of Salon and in particular the artefacts found at the Old Croatian grave sites in Dalmatia (during recent excavations ) seems to confirm this. Some historians have placed the settlement of Slavs more in the region of the late 8th century. The early sources must have reflected the raid and mercenary activity of the Slavic tribes within the former Roman Dalmatia area. Please note there are no contemporary written records about the migration/settlement events of Slavs in the area itself. 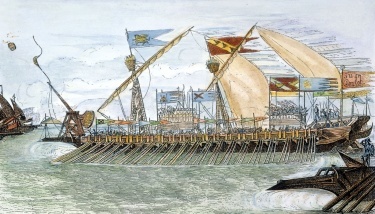 The Roman population survived within the coastal cities, for a while on the islands and in the inhospitable Dinaric Alps. These people within the Dinaric Alps were later known as Morlachs (or Vlachs). Many of the Dalmatian cities retained their Romanic culture and Latin language. Among these were Jadera (Zara, modern: Zadar), Spalatum (Spalato, modern: Split), Ragusa (modern: Dubrovnik) and Trau (modern:Trogir). These areas developed their own Vulgar Latin the Dalmatian language, a now extinct Romance language. 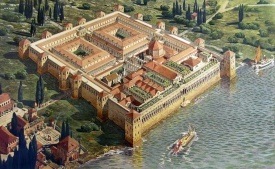 Many coastal cities and towns or the region (politically part of the Byzantine Empire-Eastern Roman Empire)  maintained cultural and economic links with the Italian peninsula through the Adriatic sea. Communications with the mainland were difficult because of the Dinaric Alps. Due to the sharp orography of Dalmatia communications between the different Dalmatian cities occurred mainly through sea links. This helped Dalmatian cities to develop a unique Romance culture, despite the mainland being settled by Slavs and after many centuries the rest of the population on the mainland also becoming Slavicized. Political rule over the province often changed hands between the Republic of Venice and other regional powers, namely the Byzantine Empire (Eastern Roman Empire), Carolingian Empire (Franks), the Kingdom of Croatia, and the Kingdom of Hungary. Inland Croatian Slavic Chakavian became Lingua Franca of the area and then replaced Latin Dalmatian (Romance). Roger Joseph Boscovich (1711-87), a Jesuit scientist who was born in Dubrovnik (Republic of Ragusa) to a father of Croatian and a mother of Italian ancestry. Republic of Ragusa. Today part of modern Croatia. From the late Middle Ages onwards certain sections of the population slowly started to merge with the Slavic peoples of Dalmatia. This process was most evident in the coastal and island regions of Dalmatia and in the Republic of Ragusa. The 1667 Dubrovnik earthquake, which destroyed the greater part of Dubrovnik (Ragusa) has been cited as a turning point for the make up of the ethnic population of the Republic. This new Slavic population within the Republic became, with time, Romanised (adopted Latin culture). Within Ragusa's community there were mixed marriages (i.e. Roger Joseph Boscovich). Croatians in Dalmatia, as well as other regions, have language remnants of the extinct Romance Latin language - Dalmatian and additionally there are influences of old Venetian in the local dialects. The Republic of Venice controlled most of Dalmatia from 1420 to 1797 (dissolved in 1797 by the French Empire). During that period, part of its Slavic population were Romanised. Venetian Dalmatia, as it was called by the Venitians, enjoyed periods of economic prosperity with the development of arts and culture. Dalmatia was greatly influenced by the northern Italian Renaissance and many buildings, churches and cathedrals were constructed in those years, from Zadar and Split to Sibenik (Sebenico) and Dubrovnik (Ragusa). 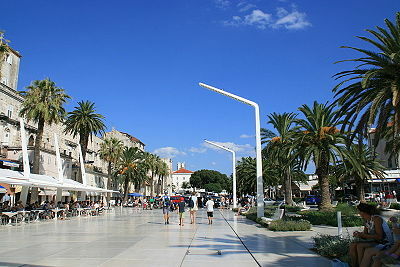 Zara (modern: Zadar) was the capital of Venetian Dalmatia. During these centuries, the Italian Venetian language became the "lingua franca" of all Dalmatia, assimilating the Dalmatian language of the Romanised Latin/Illyrians and influencing partially the coastal Croatian language (Chakavian). It is also important to mention migrations from the east, as the Ottoman Empire advanced into Europe . This greatly changed the ethnic mix in the region. Large groups of peoples stated to migrate westward. Venetian Dalmatia started to acquire new people in its region (i.e., Eastern Croatians, Albanians, Montenegrins, Serbs & others). Wars with the Ottoman's and other conflicts were all part of Venetian Dalmatia's history as well as internal strife within the province (i.e.Hvar Rebellion). Looking back through its past, Dalmatia presents it self as a region of Europe with a very multicultural and multiethnic history. 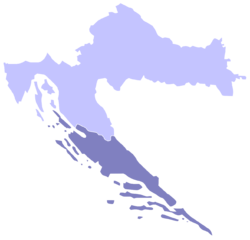 The original Roman Dalmatia is now divided between Croatia, Herzegovina and Montenegro. The cultural influence from the Republic of Venice is clearly evident in the urbanisation plans of the main Dalmatian cities of Croatia. One of the best examples is the one of Split (Spalato). In 1880 Antonio Bajamonti (the last Dalmatian Italian Mayor of Split under Austrian rule) developed an urbanisation project of this city centred on the 'Riva', a seaside walkway full of palms based on the Italian Riviera models. Today the Riva (with cafe bars) is used by the locals to walk in a typical Italian way from the Palace of Diocletian (built by the Roman Empire) towards an old square called locally 'Pjaca' (or square in Venetian). In Dalmatia, religious and public architecture flourished with influences of the northern Italian Renaissance. Important to mention are the Cathedral of St James in Sibenik, the Chapel of Blessed John in Trogir, and Sorgo’s villa in Dubrovnik. In some of the musical styles of Croatia it is quite evident that there was a merging of Slavic and Italian music. One such musical style that demonstrates this is Klapa music (klapa is an a cappella form of music - Venetian: clapa "singing crowd"). Klapa singing dates back centuries. The arrival of the Slavs to Dalmatia and their subsequent settlement in the area, began the long process of the cultural mixing of Slavic culture with that of the traditions of the Roman-Latin population of Dalmatia. The Klape appeared in the coastal and island regions of Dalmatia. In the 19th century a standard form of Klapa singing emerged. The traditional Klapa was composed around half a dozen male singers (in recent times there are also female Klape groups). Church music heavily influences the arrangements of this music giving it the musical form that exists today. Modern Klapa style singing was further developed in the the 1960s. An example of the Venetian cultural and historical presence can be seen in the small town of Perast (Perasto) in coastal Montenegro. Perast under the Republic of Venice (Albania Veneta), had four active shipyards and a fleet of around one hundred ships. Some of the buildings are ornate baroque palaces which resemble Venetian architecture. The sailors of Perast were involved in the last battle of the Venetian navy, fought in Venice in 1797. After the fall of the Republic of Venetian (12/5/1797), Perast was the last city of the Republic to lower the Venetian flag. On 22 August 1797 the Count Giuseppe Viscovich, Captain of Perast, lowered the Venetian war-flag of the Lion of Saint Mark pronouncing the farewell words in front of the crying people of the city and then buried the "Gonfalon of Venice" under the altar of the main church within town of Perast. The population decreased to 430 in 1910. 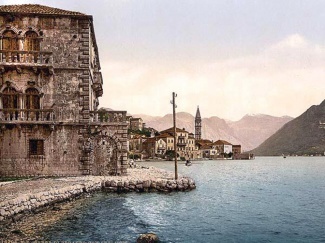 According to the Comunita' nazionale italiana del Montenegro, in Perast there are people who's local dialect have remnants of the original Venetian dialect of Perast called 'Veneto da mar'. Dalmatia was named by the Romans after the Dalmatae (or Delmatae) Illyrian tribes  who inhabited the region. In the 19th century the cultural influence from the Italian region originated the creation in Zadar (Zara) of the first Dalmatian newspaper, edited in Italian and Croat: Il Regio Dalmata - Kraglski Dalmatin. It was founded and published by the Italian Bartolomeo Benincasa in 1806. In the census of 1808 done by France (Napoleonic Kingdom of Italy) it declared Venetians to be about 33% of the Dalmatians, mostly in urban areas. 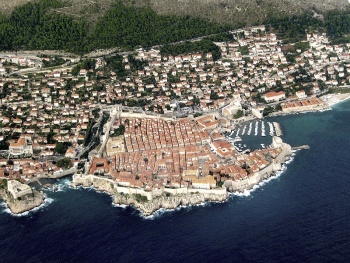 They were the majority on the islands main towns like Curzola (modern Korcula) and Lissa (modern Vis). After World War Two the Slavicisation of the of Dalmatia region was a government policy under the Communist Party of Yugoslavia. All cities, towns, villages, family and peoples surnames that are not of Slavic origin were being translated. Italian is spoken in all the seaports of Dalmatia, but the language of the country is a dialect of the Slavonic, which alone is used by peasants in the interior. The National Party (Narodnjaci) from the Kingdom of Dalmatia (Austro-Hungarian Empire). From the second half of the 19th century and early 20th century. Some Croatian historians and researchers are a legion of agit-props engaged in the “patriotic mission” of promoting the grandeur of their homeland. Their patriotism obeys to a categorical imperative: the country comes first, at any cost, even lying. They “Croatianize“ everybody and everything. Literally hundreds of public figures, artists, scientists, and academics - Italian Dalmatia had in XIX century 32 newspapers and periodicals, a rich history, an incredible artistic, academic and literary life, and glorious maritime traditions - today are mentioned as “Croatian“. Of the original Italian speaking population of the town only about 40 individuals survived. Unnoticed by academic authorities in the West, an implacable (first Panslavistic, then Pan Croat) “nationalisation” of non-Croatian history continued for decades in a dramatic crescendo. No joy, only pain and tears, is brought by being a part of the Italian Party in Dalmatia. We, the Italians of Dalmatia, retain a single right to suffer. The chapter below is taken from the Secret Dalmatia Blog site, it is written by Alan Mandic. Diocletian's palace built during the Roman Empire. The palace is part of old Split (Spalato/Spalatum). Around 6,000 of these displaced persons from the former Italian region of Venezia Giulia (Istra) and Zara (Zadar) resettled in Australia with the assistance of the IRO. After transfer of Trieste to Italy in 1954, another several thousand Giuliani were assisted to migrate to Australia. While most were classed as Yugoslav residents and citizens, an estimated 5,000 were ethnic Italians from the cities of Fiume, Pola and Zara (Gardini 2004). Given the difficulty of ascertaining the ethnicity of displaced persons from the names and nationalities listed on official IRO documents, it is unclear how many displaced persons who identified as 'Italian' settled in Western Australia. What is clear is that the Istrian 'Italians' came from different backgrounds and had different motives for leaving their homes compared with other Italian assisted passage or sponsored migrants. The former Communist Yugoslavia (which Croatia was part of) played a major role during the Cold War era in a suppressive and creating falsehood style of historical documentation (i.e the book Dalmatia - History, Culture, Art Heritage) of the region’s past. Yugoslav Communist history is now dogma in Croatia. This also would apply to the history of the Dalmatian Italians. Many of today’s Croatians live with this dogma as their reality even though the Berlin Wall fell in 1989. This dogma, falsehood was created by a totalitarian society. The Communist Party of Yugoslavia had a profound effect on the region. So much so that it has created today’s political and cultural scene. The region of the Western Balkans (former Communist Yugoslavia) has problems when interpreting its multicultural, multiethnic history and societies. This most certainly applies to the history of Dalmatian Italians, the former Republic of Ragusa and other regions. The book itself is primarily for the Croatian tourist market and is easily available in several languages in all major bookstores within Croatia. This quote is on page 137 and it’s referring to the Republic of Ragusa. The old Republic of Ragusa (with it's famous city Dubrovnik)  is now within the borders of the modern Croatia. This monolithic description is an outright lie and it’s a form of cultural genocide (the crucial word is wholly). Additionally the book did not even use the term Republic of Ragusa (the closest that it got to this was RESPUBLICA RAGUSINA on page 141). Ragusa the city's original name was used for more than a millennium. The statement is biased ultra-nationalistic propaganda and is not based on fact. This is not surprising since the “Ragusans” identified themselves as Ragusans and not as Croats. The City State and then latter the Republic was set up by Roman Latin-Illyrian families and was a nation in its own right. It was also made up of many ethnic nationalities. As a Maritime nation it traded all over the Mediterranean and even had trade with the Americas. The research I have done in the last three years has led me to this conclusion concerning the history of the Dubrovnik Croatian area (for now anyway.... I'm always open to new information). The ancient peoples of Dubrovnik identified themselves as Ragusans. Latin-Illyrian families created the Republic of Ragusa. Modern theories say that a small town was already there during the times of the Roman Empire (some say even earlier ). Refugees from Roman Epidaurus in the 7th century turned it into a fortified city. Over the centuries, it became a City State importantly called Ragusa. Later it became a Republic (1358), also importantly called Republic of Ragusa (Latin version: Communitas Ragusina then renamed Respublica Ragusina). The early medieval City State had a population of Romans and Latinized Illyrians, who spoke Latin. With time it evolved into the Dalmatian language (Ragusan Dalmatian) , a now extinct Romance language. 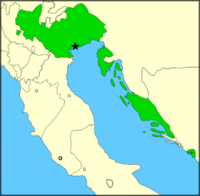 The Ragusan Dalmatian language disappeared in the 17th century. For centuries Ragusa, was an Italian-City State. According to Francesco Maria Appendini, Slavic was stared to be spoken in Ragusa on regular basis in the 13th century which means the arrival of Slavs in the City State. In the 16th and 17th century a large proportion of its ethnic population changed dramatically mainly due to various historical events in Europe as the Ottoman Empire advanced into Europe, migrations from the east started (i.e Eastern Croatians - Hercegovci, Serbs, Albanians etc,). From the west Spanish Jews (Spanish-Jews were expelled in 1493 from Spain), plus the devastating inpact of the 1667 Dubrovnik earthquake (around 5,000 people were killed). The Republic became a hub of multi-ethnic communities. The most numerous of these were the Croatian Slavs. The peoples of the Republic started to merge (including mixed marriages). Additionally the Ragusan-Slavic population were Romanised, meaning they adopted Latin Mediterranean culture. A form of Italian was spoken in the Republic, which was heavily influenced by Venetian. Books were written in Latin and Italian. Some Ragusans started to write in a Slavic language. With time two languages Italian and Slavic (which at times overlapped) became the norm in the Republic. The Ragusan Senate was so concerned with the Slav language being so present in the Republic that it decided that the use of the Slavic (in the senate) was forbidden. Dubrovnik once the capital of the Republic of Ragusa now within todays modern Croatia. The Republic in the past was a hub of multi-ethnic communities. During the Napoleonic Wars the 'Republic of Ragusa' ceased to be and It became part of the French Empire in 1808. In 1815 it was made a part of the Habsburg Empire (renamed the Austro-Hungarian Empire). 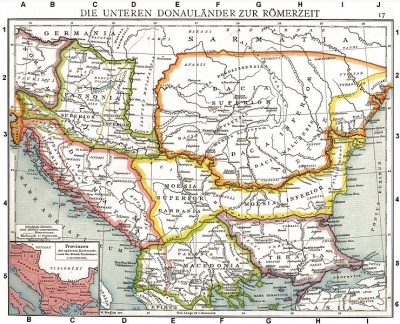 The former Republic was within the province of the Kingdom of Dalmatia and under Austrian rule. In essence the Republic's borders collapsed and was occupied. With the opening up of the Republic's borders, peoples who were once foreigners (or even enemies), were now citizens of the Habsburg Empire. A process of Croatisation (cultural assimilation) of the Republic of Ragusa's history began in the 19th century (and in part the Kingdom of Dalmatia) and this process is still continuing today. This process happened firstly in relation to the Ragusan-Slavic history and later with the Ragusan-Italianic history. 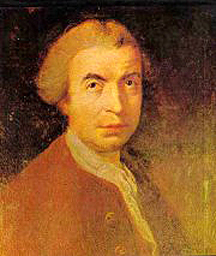 Croatian Baroque poet called Ivan Gundulić from Dubrovnik, Croatia. Ivan Gundulic (Gondola) wrote many works in Italian and Croatian (previously referred to as Slavic). "The works of the greatest poet of early Yugoslav literature, Ivan Gundulić"
The quote is taken from the book Dubrovnik by Barisa Krekic. Additionally Italian and Serbian communities both try to claim Republic of Ragusa-Dubrovnik's cultural history. "Located on the eastern coast of the Adriatic Sea, the area known as Dalmatia, part of modern-day Croatia and Montenegro, was part of the Austrian Empire during the nineteenth and twentieth centuries. Dalmatia was a multicultural region that had traditionally been politically and economically dominated by its Italian minority. In The Italians of Dalmatia , Luciano Monzali argues that the vast majority of local Italians were loyal to and supportive of Habsburg rule, desiring only a larger degree of local autonomy." 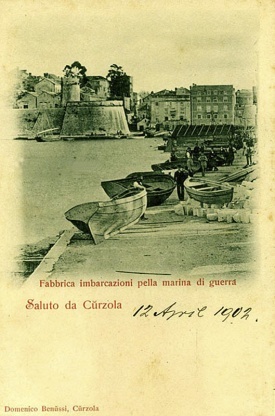 A Korcula postcard from 1902 in Italian. The last Italian language government school was abolished in Korcula on the 13th of September 1876. "Native German and Hungarian communities, seen as complicit with wartime occupation, were brutally treated; tantamount in some cases to ethnic cleansing. The Volksdeutsch settlements of Vojvodina and Slavonia largely disappeared. Perhaps 100,000 people—half the ethnic German population in Yugoslavia—fled in 1945, and many who remained were compelled to do forced labor, murdered, or later ransomed by West Germany. Some 20,000 Hungarians of Vojvodina were killed in reprisals. Albanian rebellions in Kosovo were suppressed, with prisoners sent on death marches towards the coast. An estimated 170,000 ethnic Italians fled to Italy in the late 1940s and 1950s. (All of these figures are highly approximate.)" "In the latter ages of the Roman Empire this country suffered frequently from in-roads of Barbarians..."
"In chapters 29 and 30, two similar accounts are given for the fall of nearby Salona to the Avars and Slavs ..."
^ Becoming Slav, Becoming Croat: Identity Transformations in Post-Roman and Early Medieval Dalmatia by Danijel Dzino (p212). ^ Historians of this school of thought are D. Dzino, L.Margetic, Ancic, Rapanic and V.Sokol. ^ Becoming Slav, Becoming Croat: Identity Transformations in Post-Roman and Early Medieval Dalmatia by Danijel Dzino (p52). ^ With the Serbian forces being annihilated in the Battle of Kosovo in 1389 a migration of peoples stated to migrant west ward. Dalmatia started acquire new peoples in its region (i.e. Croatians, Serbs & Albanians). ^ The Hvar Rebellion (1510 - 1514) was an uprising of the people and citizens of the Venetian Dalmatia island of Hvar (Lesina) against the island's nobility and their Venetian masters. "DALMATIA: The Land Where East Meets West is MAUDE M. HOLBACH's second book of travel in Eastern Europe. First published in 1910, this is an anthropological travel journal of an often-overlooked kingdom"
^ The Fragmentation of Yugoslavia: Nationalism and War in the Balkans by Aleksandar Pavkovic (p 47). The former Yugoslavia's political and cultural scene were heavily influenced by the cult of personality of the Dictator Josip Broz Tito. ^ “Crimes Committed by Totalitarian Regime-Brussels"
^ Editors note: Recent DNA studies have stated that more than three quarters of today's Croatian men are the descendants of Europeans who inhabited Europe 13 000-20 000 years ago. The first primary source (factual-that its authenticity isn't disputed) to mention the Croatian-Hrvat identity in the Balkans was Duke Branimir (Latin: "Branimiro comite dux cruatorum cogitavit" c. 880 AD). Branimir was a Slav from Dalmatia. Prior to the arrival of the Slavs, Roman Dalmatia was mainly inhabited by a Roman Latin-Illyrian population. ^ ""Croatia." Encyclopædia Britannica. Encyclopædia Britannica Online. Encyclopædia Britannica, 2011. Web. 09 Mar. 2011." (2011). Archived from the original on 2012-05-24. Retrieved on 2011-03-8. ^ Note: Recent findings of artefacts in Dubrovnik suggest to be Greek in origin. Romance language formerly spoken along the Dalmatian coast from the island of Veglia (modern Krk) to Ragusa (modern Dubrovnik). Ragusan Dalmatian probably disappeared in the 17th century. ^ Note: According to Francesco Maria Appendini (Italian scholar from Dubrovnik 1768–1837) the Slavic language started to be spoken in area in the 13th century. The Charter of Ban Kulin mentions Dubrovьcane, meaning people from Ragusa in 1189. This points to a even earlier Croatian Slavic presence in Ragusa (in the 12th century). The terms around 'Dubrovnik' was most probably started of as a reference to the first Slav citizens of City State of Ragusa who where Croatians. Later it became the cities' modern name. "Discussions between Ottoman officials (many of whom were of Slavic origin) and Ragusan envoys were frequently carried out in “our language” (proto- Serbo- Croatian), and both sides (these particular Ottomans and the Ragusan diplomats)" Editors Note: This event as described by John Van Antwerp Fine is from 1608. John Van Antwerp Fine work points out the arrival of Shtokavian Slavic (Hercegovci) speakers to the Republic. Shtokavian Slavic speakers in the end dominated the Slavic speakers within the Republic. One of the last Italian school that was abolished was in Korčula (Curzola) on the 13th of September 1876. "The article analyses the preparations for the foundation of the first regular primary school in Vela Luka based on numerous archival materials and bibliography. The school was founded as Scuola Elementare Minore in 1857. The introductory part examines a general context, i.e. development of Vela Luka as a town and a parish until the-mid 19th century. The article also gives a brief outline of formal education of girls." Robert Greenberg, the foremost English-language scholar on South Slav languages, believes the root of the language polemic lies in the Vienna agreement of 1850, which “reversed several centuries of natural Abstand developments for the languages of Orthodox Southern Slavs and Catholic Southern Slavs.” (Greenberg 2004, 23) Croatians and Serbians came to the negotiating table with differing experiences. Serbian linguists were standardizing a single dialect of rural speech and breaking with the archaic Slaveno-Serbian heritage of the eighteenth century “Serbian enlightenment.” Early Croat nationalists proposed a standard language based on a widely spoken dialect linked with the literature of the Croatian Renaissance. With an eye towards South Slav unity they also encouraged liberal borrowing from various dialects (Greenberg 2004, 24-26). This basic difference in approach created conflicts throughout the history of the South Slav movement and the Yugoslav state (Greenberg 2004, 48). ^ Dubrovnik by Bariša Krekić "The works of the greatest poet of early Yugoslav literature, Ivan Gundulic, 1589 — 1638, are the best testimony to this. His epic "Osman" ranks among the greatest masterpieces of early Slavic literature, and also among the most ..."
This article is a work in progress. Sections of the article are transferred from Wikipedia. Copyright is under "Text of Creative Commons Attribution-Share Alike 3.0 Unported License"
This page has been accessed 108,689 times.